Falling asleep at work is not only becoming acceptable – it’s being encouraged. Taking power naps during the workday has caught on in the offices of industry leaders like Google and Uber, with elite companies investing in napping pods and sleeping rooms. But as many people that work from home or simply remain groggy throughout the day can attest, sometimes napping lands you in a permanent state of half-sleep that permeates the rest of your day. 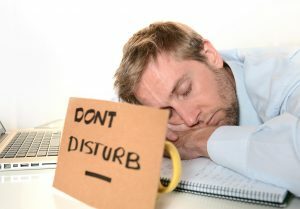 When you're really busy at work, its hard to think of how to take a power nap to sneak in some shut-eye. The trick to power napping is to know when to do it and how to do it. Follow along as we break down the method behind the madness and divulge the secrets regarding how to take a power nap. First, how long should you try to grab some shuteye? The general consensus is that you should never sleep longer than 30 minutes or you’ll risk falling prey to sleep inertia – that grogginess that can set-in post nap if you’ve entered into deep sleep. Keeping your nap at a brisk 20 minutes gives your brain the restorative benefits of sleeping without the issues of waking during your slow-wave sleep. What’s slow-wave sleep? The period of deep sleep your body will enter into after the first 20 to 30 minutes. Awaking after 45 minutes or an hour will cause your mind to remain sluggish and your eyes to withstand focusing. Theoretically you can nap for a full cycle (90 minutes) to avoid this consequence, but realistically you can’t get away with stepping away from your desk for an hour and a half. Ideally, your power nap should end safely before 4 p.m. so your nighttime sleep patterns aren’t disrupted. Some time after lunch (say 1 p.m.) but before this 4 p.m. cut-off time is ideal, but sleep experts emphasize that not all naps are created equally. Ultimately, many factors will affect your level of tiredness – you’ll want to trust your body. This means allowing for your nap to take place within a certain window. No sense waiting until 2:30 p.m. if you’re falling asleep at your desk. You must acknowledge that some of the best naps are spontaneous. Another crucial aspect of the proper power nap is psychological – allow yourself to fall asleep, don’t mentally chastise yourself for sleeping at work. It’s good for you! Now, of course, you must consider the physical attributes that comprise the perfect power nap space. The first is within you – don’t consume foods heavy in fats or sugars before you nap, and certainly avoid caffeine. Retreat to a quiet space (hopefully your workplace has a designated sleep area, but if not use an empty room) where you can minimize interruptions and noise. Create a darker environment by dimming the lights, wearing a sleep mask, or both. Your temperature will drop as you power nap, so raise the temperature in the room or curl up in a blanket. Most importantly, set an alarm for when you need to wake up. Sleeping past 30 minutes won’t help you, and you’re probably on a tight schedule at work. In addition to napping, you can use other helpful tools like stretching, going for walks, and using a Wurf board to stay focused and alert throughout your day. Power napping is proven to work – but make sure you know how to take a power nap for best results!